We continually update this page with current photos of our Multi-generational Australian Labradoodle Puppies. 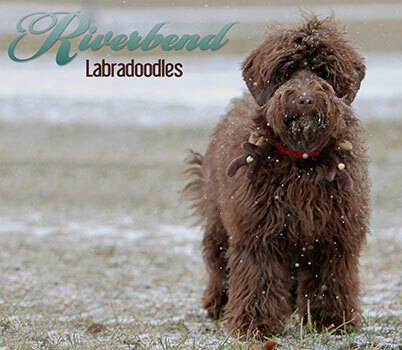 Visit and “Like” our Riverbend Labradoodles Facebook page to receive regular updates, photos and videos of our doodle-filled days. Please feel free to email us with any additional questions you may have about our puppies, our upcoming litters or our reservation process. Clark and Noodle’s chocolate and caramel babies arrived February 10th and they will be available to their new homes April 10th! Their Large Medium size Australian Multi-generational Labradoodle Puppies will be around 35-45lbs. This litter is fully reserved. Noodle is a Medium size Australian Multi-generational Labradoodle with a gorgeous, soft, fleece chocolate coat. She is sweet and loving and will look into your eyes and melt your soul. She has an amazing flop-a-doodle personality and loves a good belly rub as much as a game of fetch. She has a gorgeous head and conformation, beautiful bone structure and show stopping beauty. Her babies will be stamped with the Riverbend look and type that we strive for and feel is so important within our breeding program. Our amazingly handsome boy Clark came all the way from Rhode Island to join our family and our program! He is a small Standard size Multi-generational Australian Labradoodle with a soft, wavy fleece caramel and white coat. Clark is sweet, mellow, and a perfect doodle cuddle bug. He loves everyone he meets and brings a smile to your face, along with a sloppy smooch. He is already proving to produce a solid, easy going, therapy type temperament in his babies. We are so blessed to be able to include Clark and his genetics as an important part of our breeding program, and are very excited to see his puppies arrive. It is not our goal to “sell” you a puppy, it is Our mission to provide a valuable family member. 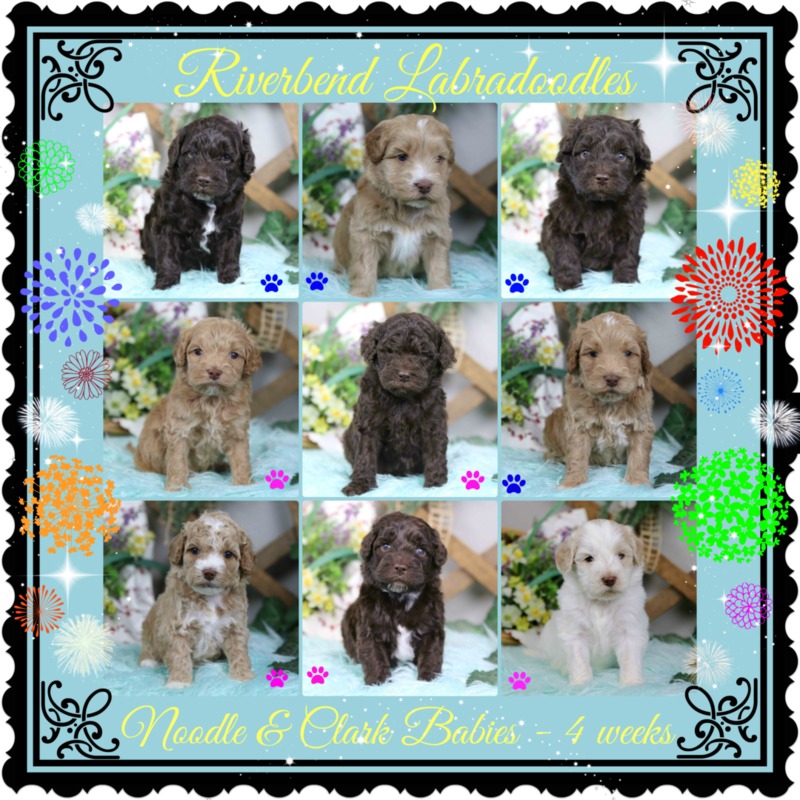 Before going to their new homes, Riverbend Australian Labradoodle puppies are Vet checked, microchipped, given age appropriate vaccinations, spayed and neutered, de-wormed routinely, and heartworm, flea, and tick preventative is started. We guarantee, in writing, the health of our puppies for two years. All puppies are sent home with complete feeding and care instructions, a shopping list, training information for a smooth transition from our home to yours, and a “litter-scented” toy from home to cuddle with. Registration paperwork and pedigree from the Australian Labradoodle Association of America will also be provided. We offer our continual support, and welcome you to draw from our knowledge and years of experience, for as long as it is needed. 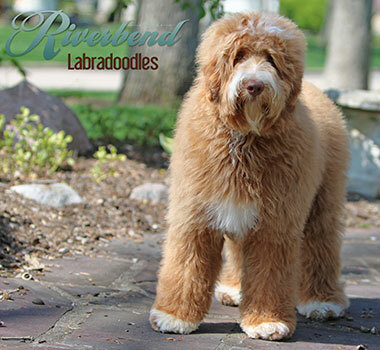 Riverbend Australian Labradoodle puppies are raised in our home, for proper socialization and handling from birth. We believe the key to a developing a healthy, rewarding relationship, lies in starting your puppy correctly. This will set the stage for a balanced, lasting relationship and a puppy that can handle transition into his new home and family quickly and easily. We start our puppies early with exposure to proper manners, house breaking, crate training, grooming, and handling. We evaluate our puppies‘ individual personalities and help our families in choosing the puppy that fits best with their family, activity levels, and expectations. Once your particular litter has arrived, we welcome visits from those families that would like to get to know us and their puppy. We are very protective of young, developing immune systems, and ask that you come straight from home, and do not stop along the way or engage with dogs you do not know to limit the possibility of spreading germs, bacteria, or disease. You can visit on the scheduled family visit weekend, and we are happy to share that special time with you and your new family member. We will have you visit with several puppies, and sometimes the entire litter, so you are familiar with their temperaments, and can be an active participant in choosing the puppy that is to join your family. For those long-distance families, we schedule FaceTime visits so they can be included and active in the visitation process also. When you are ready to add a Riverbend Labradoodle puppy to your family we would ask that you email us directly, as we have an informational email that helps to get you started. We love for you to share with us information about yourself and your family, your lifestyle and activity level, and things that you like to do as a family. We would like to hear about your previous pet history, and what you are looking for in the addition of a puppy to your family. We don’t use forms and check boxed lists, as we would prefer to be more personally involved with our families and get to know each of them through the adoption process. When you are ready to place a reservation, you can send a personal check to us. We hold your deposit check, as our deposits are refundable through the age of 4 weeks of whichever litter you ultimately are offered and say yes to, so you will have plenty time to be sure this is the right decision for your family, and we have time to be sure we have the right family for our puppy. If you do change your mind in the process, we can easily shred your deposit and take you off the reservation list. Once you are placed on a litter, we will send helpful information directly to your family every two weeks to help prepare you for your puppy, and we also include new puppy pictures so your family can be involved in the growth and development of the litter. All parents have OFA hip, OFA elbow, and OFA CAER eye clearances before they are bred, as well as breed specific health clearances such as prcd/PRA, EIC, heart certifications, and vWD, to ensure that we have the healthiest puppies possible. We carefully research and select only the finest dogs for our breeding program, in order to produce a Labradoodle true to type, with predictable size, temperament, and coat. Our years of dedication to breeding only the finest American and Australian lines is evident in the style and grace of a Riverbend Labradoodle. We have stamped a consistant type and look that is unmatched in the Labradoodle community. Puppies can be shipped, at buyer’s expense, from the Detroit Metro Airport in Michigan. We use Delta Airlines VIP Service or direct flights when possible, so the puppies are hand-delivered to and from the plane. Puppies are available via air after the age of 8 weeks. They will see our Veterinarian at 6 weeks and again just before leaving to ensure a current health exam and health certificate is completed. We work closely with our families to choose a major airport that is closest to them, but that still offers the most direct route. We also choose a day and time that works well with our families and their schedule, but at certain times of the year, weather temperatures may determine when we can fly our puppies. Shipping within the United States generally costs around $400 for airfare and your puppy’s travel kennel, however, older puppies or International flights can be more expensive and will be priced individually. We do not charge extra for your puppy’s additional Veterinary exam, health certificate, or travel to the airport, we will provide this service to you. 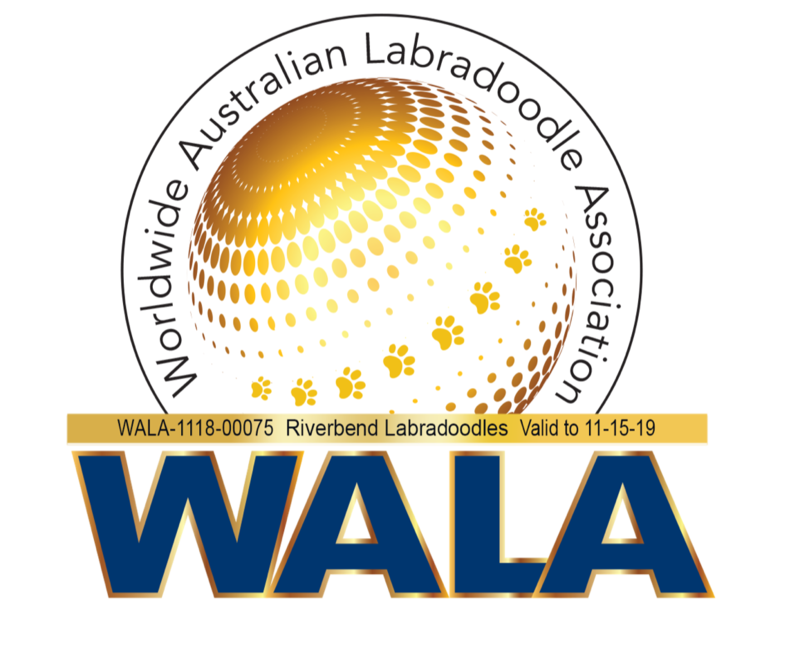 We are also blessed to be involved with a fantastic Labradoodle Breed organization, WALA is the Worldwide Australian Labradoodle Association. This is a worldwide organization bringing together 100 plus Breeders from the United States, Canada and Europe that are dedicated to protecting the breed we love so much. We are proud of our past participation as Board Members of the ALAA, Australian Labradoodle Association of America, as well as being Founding Members and current Board Members of WALA. We are honored at the opportunity to help protect and promote the breed we love so much with our participation in these organizations. Why is this important to you? Our Australian Labradoodles must meet requirements for health testing, and you can be assured that everything is being done to breed the healthiest Australian Labradoodle puppies possible. Our health warranty/contract provided to our families has been accepted and approved. All our litters of puppies must be registered and appropriate pedigree information provided to families. 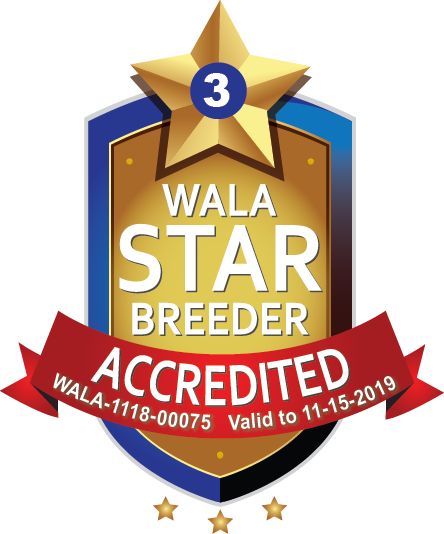 Being a WALA registered Australian Labradoodle Member Breeder means you can be assured we are responsible and accountable to an organization that has very strict guidelines and requirements in place that protect you as a consumer.